Ring in the new year at Tampa‘s most exclusive New Year’s Eve party. 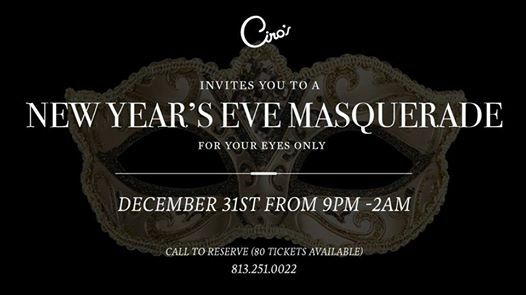 Ciro’s invites you to a “For Your Eyes Only” Masquerade. Featuring live burlesque performances! Include: Open bar, Raw Bar, Passed Hors D’oeuvres, Live burlesque performances….and more special surprises throughout the night! Limited to 80 tickets. $175.